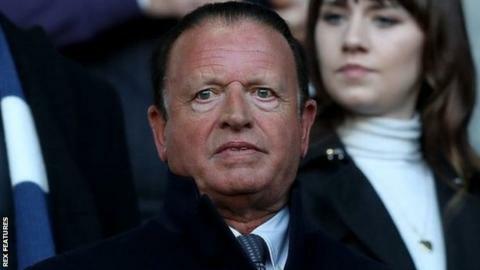 In January, Bolton owner Ken Anderson admitted the club "needs someone with greater financial resources than I have"
Bolton Wanderers chairman Ken Anderson has told staff he has an agreement in principle to sell the club and the deal could be completed within 48 hours. Anderson reached the same stage in February with a consortium led by businessman Parminder Basran, but that deal fell through. Taking a majority stake in 2017, he currently owns 94.5% of the club through his Inner Circle company. In January, he said he was "doing his utmost" to find a buyer amid protests. Staff were told on Wednesday that the club hoped the latest deal would be completed within 48 hours, with the new owner ensuring March salaries would be paid on Friday. February's staff wages were paid late, while players and coaching staff did not receive theirs until 12 March. A week later, Bolton confirmed takeover talks with another interested buyer, believed to be the Football Ventures consortium, had ended. The following day, the club were given two weeks to settle their debts or risk going into administration after appearing in the High Court over an unpaid £1.2m tax bill. The case is due to be listed at the High Court on 3 April.